Gilbert Hay Blanche was serving with the 18th Battalion of the Durham Light Infantry (DLI) and was stationed in Hartlepool when the town was bombarded by the German Navy in 1914. His company were then detailed to help with the clearing up of the destroyed buildings. Gilbert was the only child of Thomas and Agnes Blanche. They came down to the northeast from Shetland where Thomas was a seaman, but by the time Gilbert was born, the couple were running a dining room on the Scotswood Road, Newcastle. Ten years later, in 1901, Thomas returned to the sea, leaving Agnes to raise Gilbert in South Shields. On leaving school, Gilbert found work as a grocer’s errand boy, but in 1908, his father died and his mother remarried. 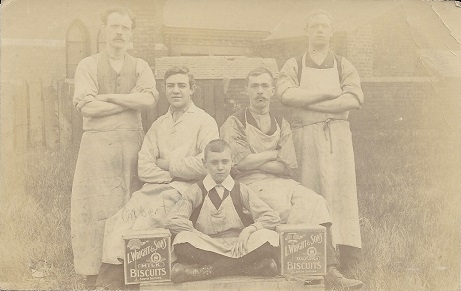 The family moved to Carlisle where Gilbert went to work in the warehouse of Carr’s Biscuit Factory. Agnes’ second husband also died soon after their marriage, and Gilbert returned to South Shields. (Agnes had married for a third time and had returned to Shetland to live). 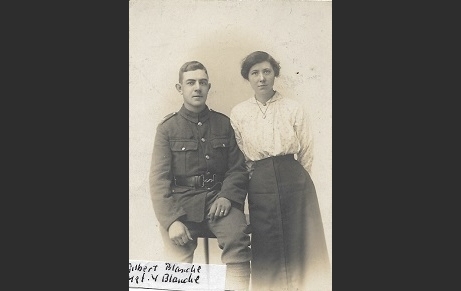 When war with Germany was declared in 1914, like so many other young men, Gilbert rushed to enlist, joining the 18th Battalion of the DLI, (also known as the Durham Pals) as a private. 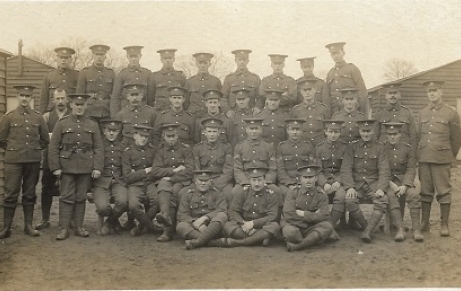 After basic training at Cocken Hall, Gilbert found himself manning the trenches along the coast near Hartlepool following an alert that a raid on the town was expected by enemy ships. 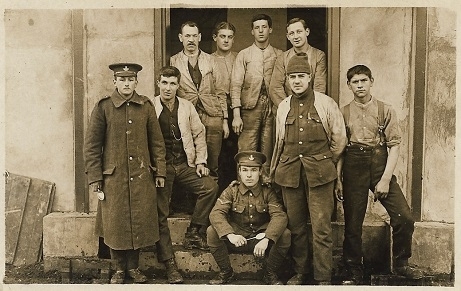 On 16 December, Hartlepool came under heavy shelling, which resulted in 127 deaths, of whom nine were soldiers of the DLI who were guarding the docks and railway lines. 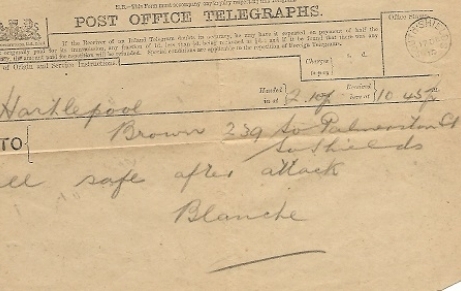 Gilbert’s company was detailed into rescue parties and stretcher bearers but Gilbert still found time to send a telegram to his fiancée, Margaret (Madge) Brown, back in South Shields to let her know he was safe. In 1915, whilst still undergoing military training, Gilbert had a weekend’s furlough and was walking in the Northumbrian Hills with Madge when they were caught in a storm. With nowhere to shelter, Gilbert was actually struck by lightning and knocked unconscious. Amazingly, he survived and when he came to, he found his boots had been blown off and were some twenty feet away from him. He was taken to hospital and spent several weeks there but the injuries to his feet and legs were such that he was invalided out of the army. He would walk badly for the rest of his life. Gilbert married Madge in South Shields and in 1918, their son, Ben, was born. A daughter, Agnes, followed seven years later, then another daughter, Isabella, who did not survive infancy. Gilbert returned to work as a store man, eventually ending up in the shipyards of the Tyne, where he became an unofficial shop steward, ensuring the company maintained first aid equipment for their workers and that they paid the proper rates of pay for overtime, amongst other things. He also became a scout leader, arranging trips to the countryside of Durham and Northumberland for lads from the back streets of Shields. During the Second World War, Gilbert again did his bit for the country, manning the search lights over the Tyne. Only once in the five years of service did his unit help to bring down an enemy plane and such was their celebration that when he rolled home the next morning, he found himself in big trouble with his wife! When Madge died in 1953, Gilbert moved to Stafford to be with his daughter and her young family. He spent his last years growing vegetables and searching seed catalogues. He died on 19 December 1961, and is buried in St Lawrence Church in Coppenhall, Stafford.